Sri Radha Krishna Temple or ISKCON Temple of Chennai is dedicated to Lord Krishna and his consort Goddess Radha. 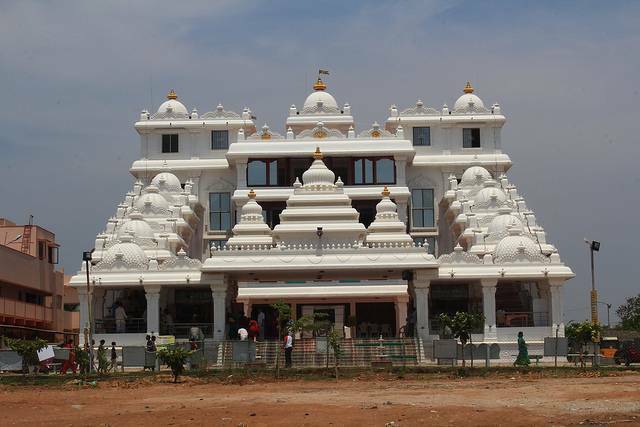 The Chennai ISKCON temple also functions as spiritual qrt and cultural Center. There are 5 levels in this temple which sprawls over 1.5 acres of land. The Prasadam Hall is situated in basement; an auditorium where various cultural and spiritual programs are conducted is located in ground floor, whereas the huge prayer hall is located in first floor. There are statues for Krishna, Radha, Vishaka, and Lalitha. There is also statue for Jagannath Baladev Subhadra and Sri Nitai Gauranga. The first thing which welcomes you as you enter the portico is the true-to-life statue of a Cow feeding her Calf. There is a book stall where sovereigns, spiritual books etc are available for purchase.